Howdy all! Is it Winter yet? I know, I'm complaining about the weather yet again but honestly, I'm melting" I've just had a glance at my phone which tells me its 30 degrees and its only midday. 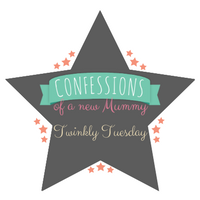 This week's Tuesday Twinkler is Mum on a Mission for a Better Life who has shared an honest and inspiring post about winning her battle with nicotine. Anyone that has smoked and tried to stop, or has watched a family member attempt it, will know just how hard it is. I was a smoker myself, mostly social, many years ago, but stopped when D and I started dating. Even now, there's many a day I wish I could have a cigarette so I know just how hard it is. Well done Denise on a huge achievement.